So today being Memorial Day, the more or less official start to the summer season, gives me reason to taunt? flaunt? that this is going to be my first summer in Maine. Maine, as you may or may not know, is called Vacationland, at least on the liscense plates. It is also referred to as The Pine Tree State on the quarters, and the Way Life Should Be on the sign as you cross the state border. 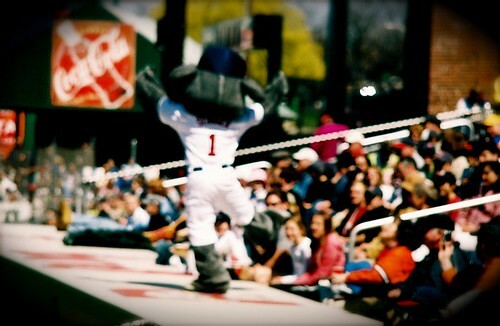 All of this is to say, 40-hour work week aside, this is going to be an awesome summer. And Mr. Cleaver and I kicked off our Memorial Day weekend with style. After our usual yoga class (me) and tennis match (Mr. Cleaver), Mr. Cleaver kindly drove up to Brunswick so I could meet one of my favorite knitwear designers, Ysolda Teague, at Purl Diva. 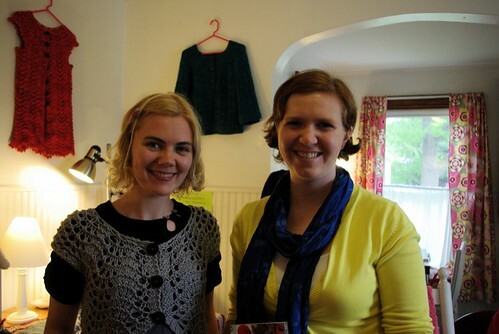 I got to chat with her briefly and got a signed copy of her adorable book of patterns, Whimsical Little Knits. And just today I found out that she's going to be at my regular Tuesday night knitting group, so double yay! 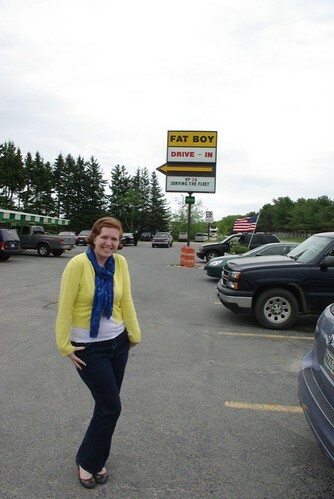 Afterward, Mr. Cleaver and I strolled around the Bowdoin College area, poking our heads into any shop that looked interesting and then made our way to Fat Boy Drive-In for an early dinner. 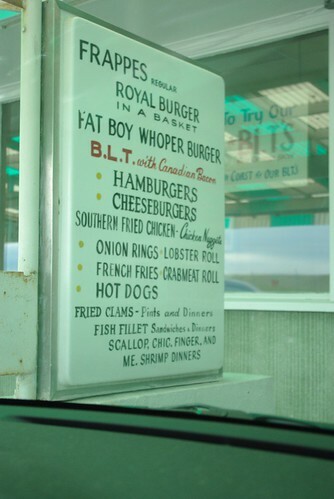 Unsurprisingly, I love drive-ins and Fat Boys is pretty quality. My chocolate shake was perfect (I guess they're called frappes [pronounced "fraps"] here), and though not on roller skates, our waitress was very friendly. 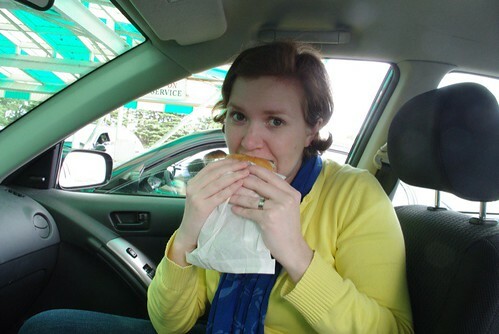 And food is always more exciting when eaten from a tray hanging from your driver's side window. Sunday we took low-key, running some errands and reading the paper; potting some plants and eating a cherry pie I had made and frozen months ago. Today we went to a Seadogs game (a minor-league affiliate of the Boston Red Sox) and then went to a cook-out at my Mother-In-Laws. All-American and all awesome. This is going to be a great summer.